Tomorrow’s Deadline — brand new perks sweeten the deal! A quick reminder about tomorrow’s early deadline for Now at Bat sponsorship commitments. Individuals/businesses who commit to a sponsorship (any level) by tomorrow, October 31st will be invited to a private VIP Party with MLB players on November 15th! This is a brand new perk for sponsors that we’re very excited about. By committing early, sponsor names/logos will also be included in our forthcoming marketing and promotional materials — this is another great perk, especially for companies. Just reply to this email to let me know your commitment level. You may also complete the Commitment Form or register now to take advantage of these great benefits. 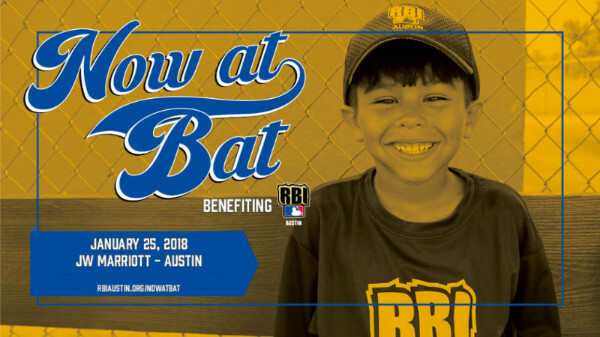 Thanks for helping to make Now at Bat a great success for our RBI kids again this year! Please let me know if you have any questions. P.S. Do you know any businesses or individuals who might be interested in being a sponsor? Forward them this sponsorship brochure today, and tell them about tomorrow’s early commitment opportunity. We’re able to dig deeper with the young men in our high school programs because of committed sponsors like LifeTrends. This summer our high school regional players were able to participate in high-level competition in New Orleans against some of the best RBI players in the country. This was due in large part to LifeTrends’ support and their commitment to engaging and developing future leaders through RBI Austin. Beyond simply growing in numbers, we desire to dig deeply with those involved in RBI Austin because we know that neither he who plants nor he who waters is anything, but only God who gives the growth (1 Cor. 3:7). We are committed to the development of the whole child. Personal and spiritual growth are critical to the development and transformation of young leaders along with their physical and academic development. If our programs only focused on developing better ball players, we’d be missing the mark. Your involvement allows us to engage and develop inner-city Austin youth athletically, academically, and spiritually, empowering them to lead the transformation of their communities. We have a growing number of programs in place where kids and volunteers get to dig deeper and grow spiritually, emotionally, and physically. Your support enables us to sustain gospel-based, relational programs like our league and academy teams, our player discipleship program Bible studies, our monthly mentoring fun nights, our mentor enrichment events, and our mentoring program Bible studies. We’re growing because of you! Since RBI Austin began in 2011, we’ve seen the Lord faithfully grow our programs, our volunteers, our donors, and our impact. Because of your help, RBI Austin continued to grow in 2017 and this is our largest year to date. We’ve served more kids, engaged more families, and teamed up with more volunteers and coaches than ever before. More kids, teams, and volunteers! The number of inner-city Austin youth participating in RBI Austin programs grew by 37% in 2017. That is 318 MORE kids engaged than the year before. Because of you, 1,171 kids were involved in a program where the gospel is central and where volunteers, donors, and staff care about their athletic, academic, and spiritual development and transformation. When we began RBI Austin’s Mentoring Program in 2014, we had a vision to match every Oak Springs 4th grader with a caring mentor. Mentors who would commit to being matched with an East Austin 4th grader and invest in their lives through high school graduation. Three years into the program, and we’ve had 84 caring mentors say “YES” to coming alongside a mentee and develop them into the future leaders of their communities. Last year 28 mentees received a mentor, and because of your support, we’re able to sustain these gospel-based, relational programs. RBI Austin exists to engage and develop inner-city Austin youth athletically, academically, and spiritually, empowering them to lead the transformation of their communities. Love of the game? Passionate about helping inner-city youth? Deeply believe relational programs like gospel-centered mentoring lead to life-long transformation? Whatever your reason for engagement, we’re grateful for you and for what you bring to our RBI Austin team. Join us in celebrating what you’ve made possible this year. View our impact report. Did you know that 80% of our participants are economically disadvantaged? With 31% of participants being considered mobile. This is nearly double the state average (16.5%). A student is considered mobile if he or she changes schools within a given school year. We know that household income directly affects kids playing sports. Research tells us that money is the biggest driver of early sports participation. Only 38% of kids from homes with $25,000 or less in income play team sports, compared to 67% of kids from $100,000+ homes. High school athletes achieved a level of education 25 to 35% higher than their non-athlete classmates. High school athletes had 12 to 31% higher wages than their non-athlete counterparts. Interested in serving with RBI Austin? Join us for our October Volunteer Orientation to learn more about us as well as current ways to get involved. Dinner is on us!